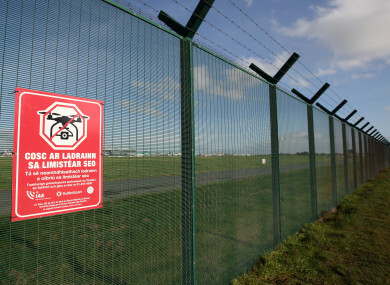 GARDAÍ AT DUBLIN Airport are seeking the public’s help to prevent incidents involving drones like that which brought operations there to a standstill last month. A flyer has been distributed to plane spotters at Dublin Airport welcoming them to participate in the new Dublin Airport Drone Prevention Project. This is in addition to an initiative launched by the DAA in 2017 specifically aimed at drone uses. The latest campaign by gardaí based at the airport is aimed at informing the public, including plane spotters, of the dangers of drones being operated anywhere close to the airport and to ask them to report and document such occurrences. On 21 February last, operations at Dublin ground to a standstill for half an hour after a drone was spotted in the vicinity of the airfield. Hundreds of plane spotters descend on the airport every day documenting and photographing arriving and departing aircraft from a number of vantage points. Flyers were distributed spotters at various popular plane spotting locations around the airport last week. It read: “As I am sure you are aware, illegally operated drones around the airfield and the flight paths, pose an extreme danger to aircraft and to the operation of the airport itself. Email “Flyers distributed to plane spotters as Dublin Airport seeks to prevent drone incidents”. Feedback on “Flyers distributed to plane spotters as Dublin Airport seeks to prevent drone incidents”.